The pattern is written for an XL/2X, but I have included the necessary adjustments for sizes XS-4X…however, since this yarn is super bulky, the smaller sizes may not look as good as the larger sizes. The weight of the yarn does not really lend itself to sizes smaller than medium. 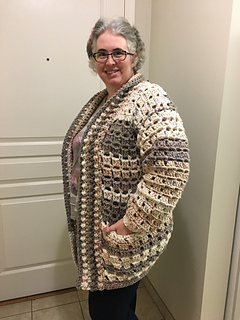 I used 5 full cakes for the entirety of the cardigan with the exception of the pockets. I used less than 1/4 of the 6th cake for the pockets.